If you’re known for loving your photography, chances are someone will ask you at some point to take a few shots at their wedding. It’s quite a responsibility to be asked to be the unofficial (or even official) photographer at a wedding. Flattering perhaps, but terrifying none the less. We’ll leave the technical advice to the experts, but here are a few general suggestions which we hope will help make the day run smoothly. 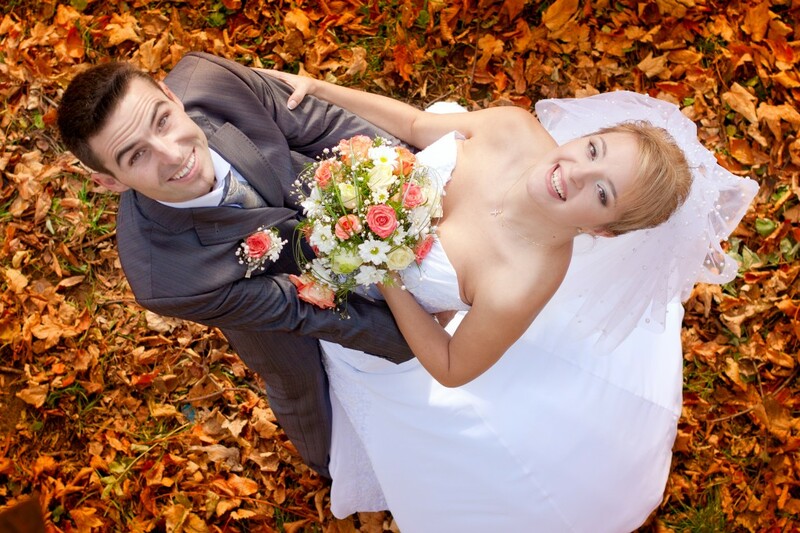 Get the couple to think ahead about the shots they’d like you to capture on the day and even show you examples of the shots, and style, of photography they like. Then you can compile a list that can be checked off during the day, giving you peace of mind you’ve got everything covered. This is particularly helpful for family shots. There’s nothing worse than getting the photos back and realising you didn’t photograph the happy couple with Grandma! The friends and family group shots are probably the most stressful time of the day. People are all over the place, you are (blissfully) unaware of family dynamics, and if you’re not careful the whole thing can get quite chaotic. 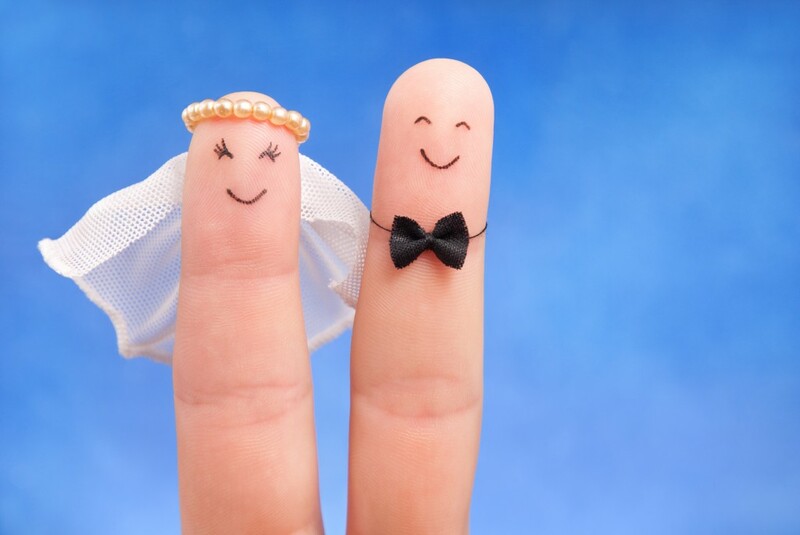 Get the couple to nominate one or two trusted souls – ideally quite vocal! – who can help you get everyone organised. This way, you’ve got a trusted team who can help keep things moving, and everyone can get back to the party. A bossy best man or chief bridesmaid will normally step up to the plate (and should know most of the wedding party) or perhaps a family member from each side. If you can, go to the key venue(s) with the couple well ahead of the day. Take a few test shots too – they will make lovely ‘engagement’ shots and help make everyone feel a little more relaxed ahead of the big day. It will also give you time to scout positions and backdrops so you can simply concentrate on the shots themselves on the day itself. It’s particularly helpful to scope out the areas where the formal shots will be taken. You’ll want uncluttered areas out of direct sunlight, where there’s unlikely to be a rogue child wandering in the background! If you can, also attend the rehearsal of the ceremony where you’ll gather a lot of great information about possible positions to shoot from, the lighting and the order of the ceremony. So much can go wrong on the day – so you need to be as well prepared as possible. Have a back-up plan in case of inclement weather as well as all the obvious preparation like batteries being fully charged, memory cards blank and spares of both! Whilst we’re talking about spares, also try and get your hands on a second camera – ideally set up with a different lens. Also, don’t forget also to turn the sound off on your camera settings! Make sure you think about routes and times to make sure you get to places in plenty of time. A late and flustered photographer will never do! A full itinerary of the day is also handy so you’re clear what’s happening next. 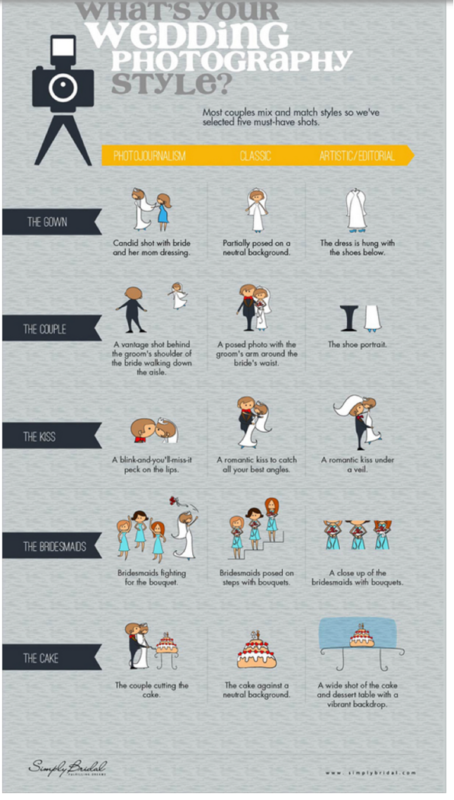 Use this handy infographic to help focus the happy couple on the style of photography they like for the key parts of the day. Also, have a flick through any wedding magazine, and you’ll see that capturing the detail of the day really does give the wedding album that extra dimension – the rings, backs of dresses, shoes, table settings etc…all add a splash of interest that shouldn’t be missed. 6. Rope in an assistant! Having a second backup photographer can be a lifesaver. It takes a lot of pressure off you to get every last shot, and someone else might see opportunities you have missed. You, for example could concentrate on the formal shots, whilst your assistant moves round getting lovely natural shots of the rest of the wedding party. Uploading the photographs taken earlier in the day to a computer and letting then rotate as a slideshow in the evening adds a real sense of fun to the day. It also gives you an opportunity to think about anyone/anything missing or you’d like to try and capture again. 8. Don’t forget your ladder! As with any great photography, changing your perspective is the key to a great shot. Get creative and mix things up by taking shots from down low, up high and at odd angles. The beauty of getting up high is that you can get everyone’s face in and fit a lot of people in one shot, which is perfect for the more formal poses. Undoubtedly, things will go wrong – but actually these glitches are often the best part of the day. The best man fumbling for the ring, the rain pouring just as the ceremony ends, the flower girl plonking down in the middle of the aisle…the day is never perfect but it’s actually these moments that are most fondly remembered. Attempt to capture them and you could end up with some fun images that sum up the day perfectly. Its also a good idea to have a plan for inclement weather. Check here for some great ideas on taking photos in the rain. 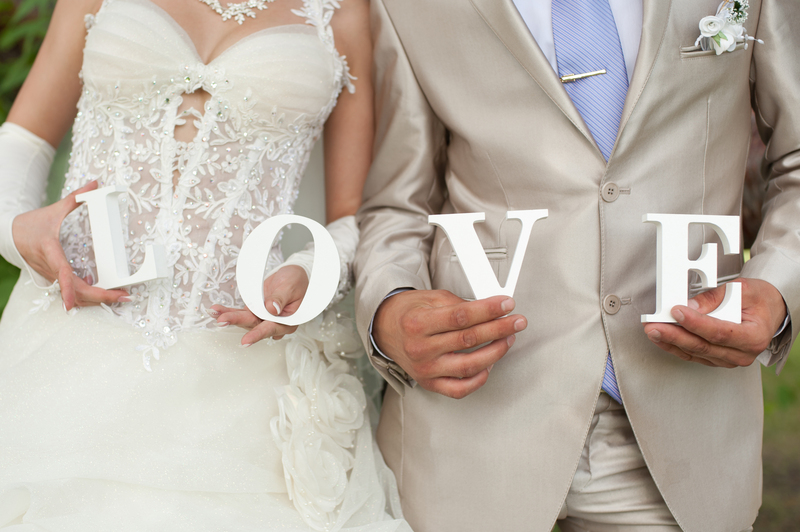 Weddings are about celebrating – they should be fun. The more fun you have as the photographer the more relaxed those you are photographing will be. So forget the nerves, and enjoy the day. Read more fantastic tips here. Got any more great tips? We’d love it if you shared them with us.